Railpictures.ca - sdfourty Photo: ….oh ! The Rock….. Tri weekly (Tu Th Sa) Terra Transport mixed #232, Carbonear to St. John’s, at Brigus Jct. high balling to St. John’s 42 miles east. TT mixed #232 powered by GMD built (1956) six axle ( A–1–A trucks ) G-8′s #800 and #805 ( the latter at Delson, P.Q.) 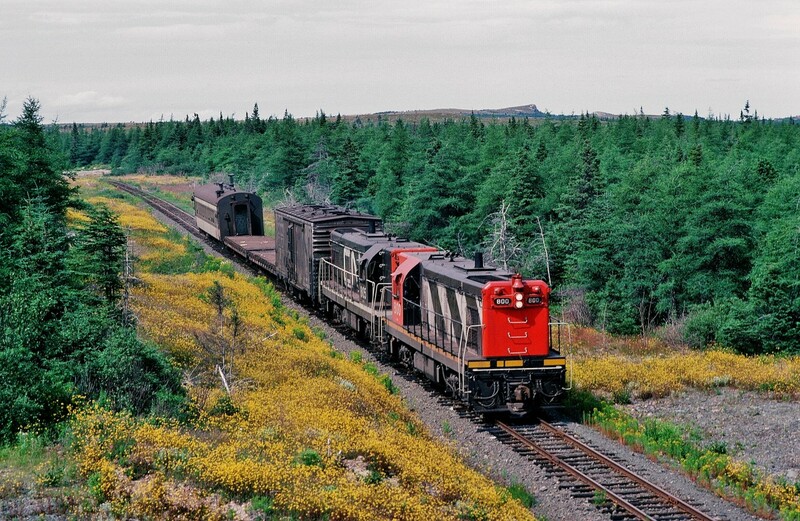 Kodachrome by S Danko, 15:30 Thursday Aug 5, 1982 at Brigus Junction, Newfoundland What’s interesting the Carbonear branch, TT mixed trains #231 and #232 operated to September 1984 Love those yellow Newfoundland wild flowers ! More Carbonear Branch TT #231 at Carbonear Saturday August 7 TT #232 near Clarke’s Beach Saturday August 7 TT #232 at Clarke’s Beach Saturday August 7 Even more in Ken’s book: Rail Around the Rock: A Then and Now Celebration of the Newfoundland Branchlines by Kenneth G. Pieroway What’s absurd: To abandon the Newfoundland Railway (TT as of 1979) under the December 1987 Agreement that Province received a one-time payout ( 1988 dollars) of $800 million (CAD) from Ottawa to St. John’s to fund highway improvements. ( Basically that abandonment deal rivals the Churchill Falls 65 year hydro power deal in its shortsightedness and I bet that highway has had to be rebuilt multiple times since 1988 ) No surprise that Premier Brian Peckford and the P C government got voted out of power in the 1989 Provincial election ( and the PC’s did not form another Provincial Government until 2003). sdfourty | Railpictures.ca – Canadian Railway Photography – photographie ferroviaire Canadienne. at Brigus Jct. high balling to St. John's 42 miles east. Love those yellow Newfoundland wild flowers ! To abandon the Newfoundland Railway (TT as of 1979) under the December 1987 Agreement that Province received a one-time payout ( 1988 dollars) of $800 million (CAD) from Ottawa to St. John's to fund highway improvements. No surprise that Premier Brian Peckford and the P C government got voted out of power in the 1989 Provincial election ( and the PC's did not form another Provincial Government until 2003). No sorry required Mr. Mooney! I’m in complete agreement! If Railpictures ever decides to do a “Five Best of Each Province” (and territories) this would be my number one favourite for the “Rock”. (sorry, Ken ) ) Stunning. A beautiful shot Steve. Just seeing this for the first time and it is amazing! Oh my.. this is very nice Steve.